Double Dare Launches it's OMG! Masks in Malaysia ! A good mask session is like pressing the backspace button, effectively deleting all the late night partying that is shows on your face or the fact that you slept with your makeup on. Whatever it is, masks are something that your skin will definitely thank you for. Now, the well-known California brand - Double Dare is available in Malaysia ! 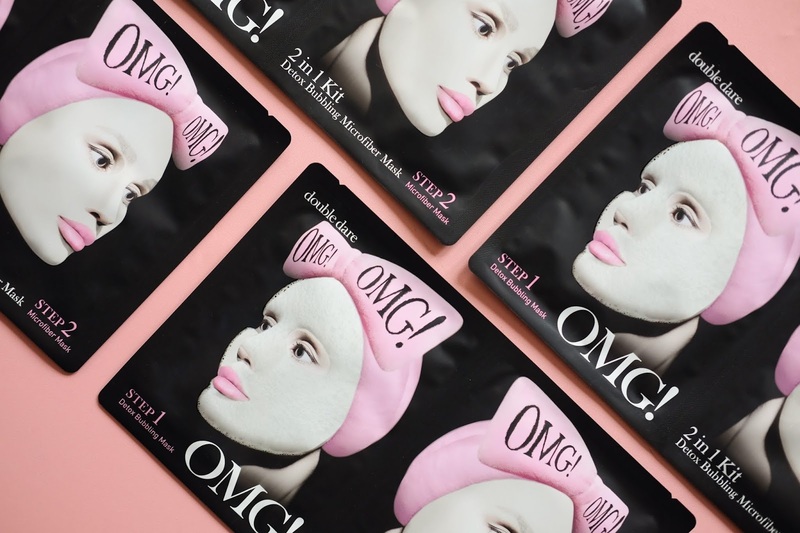 Double Dare offers a range of hassle-free home facial spa masks and debuting in Malaysia, for its first launch the highly-anticipated OMG! 2-in-1 Kit Detox Bubbling Microfibre Mask takes the cake. Here are the things you must know ..
WHAT : A 2-in-1 home facial spa masks for effective deep cleansing and moisturizing effect. HOW : There's two parts to the masking. Apply the Detox Bubbling Mask on the face with or without makeup and leave it on for 1-3 minutes while it generates small bubbles, then rinse it off. Later on, apply the Microfiber Mask for 15-20 minutes to allow skin to absorb nutrients and massage excess serum into the skin. WHY : The Detox Bubbling Mask will generate small carbonated bubbles to stimulate and cleanse skin by removing all traces of oil, sebum and dead skin. Whereas the Microfiber Mask will feed the skin with various nutrients, hydrolyzed collagen and plant-based stem cells to give your skin a healthier, younger looking glow.